Once again you confuse weather with climate. You need a longer sample period than four weeks to measure climate trends. Once again you confuse weather with climate. You resort to this old BS line to avoid the fact that you challenged the old man and he put up. The Earth is cooling, which is a bad thing. IF it were warming a few degrees that would be a good thing for life. Can you acknowledge that more CO2 in the atmosphere is good for plant life? You resort to this old BS line to avoid the fact that you challenged the old man and he put up. A single temperature in one city can no more indicate climate trends than a single stock price can tell you if it is a bear or bull market. Until you learn this simple truth, I will keep having to correct you. The Earth is cooling, which is a bad thing. No, the Earth should be cooling, but instead it is warming. Denying the truth does not make it as less true. IF it were warming a few degrees that would be a good thing for life. Warming a few degrees over thousands of years may be a okay, but this same warming in a few centuries could cause the extinction of half the species on Earth. Do you think that would be a good thing? Can you acknowledge that more CO2 in the atmosphere is good for plant life? More CO2 in the atmosphere may be good for plant life, but I'm more concerned with the human species. Strawman. No one said anything about a single temperature. I reject the premise of your question. Clearly, you do not want to answer my question about the benefits of warming to life on Earth - especially to humans. Then you must realize warming is far better for humans than cooling. I applaud your abdicating the foolishness of this hoax in the goal of benefiting the human species. Whoa, hold on there a minute batman! Who says the earth should be cooling, and why? By your logic, we should be in a deep, deep freeze after the ice age. 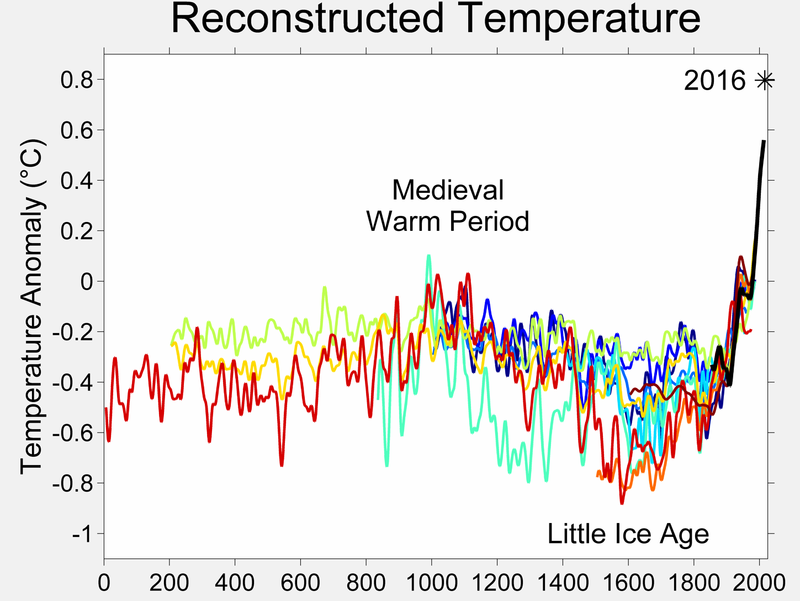 Temperature went UP during the mid warming period of about 400 or 500yrs ago. The earth should be cooling is such an erroneous statement, I just do not know what to say! It is a proven fact that earths mean temperature fluctuates over centuries. Let me also state the obvious, what everyone else is aware of except maybe you and the green, green, socialist machine---------->if we look backwards to the advent of homo sapiens, the temperature has swung far more than 1, 2, 3, or 5 degrees 1 way or the other. We are still here, are we not? And, we are faaaaaar more technologically advanced than our predecessors were, and yet they survived and thrived. Therefore, you, Al Gore, and the rest of your ilk are all barking at the moon trying to convince ANY ONE that this 1 or 2 degree change in either direction is Armageddon, and that is even IF YOU HAD proof it was because of humans. This is a free country, and any religion some one chooses to believe in is fine, as long as they do not impose their religion on us. It is called religious freedom. Your religion of man made climate change is fine by me, just keep it out of government. Seperation of church and state don't you know; along with......no, national religion. Cold records keep getting broken. My graph shows it was cooling until about 150 years ago. I wonder what that corresponds with? Reject it all you want. It's not the amount of temperature change but the time frame it is occuring in that determines how much it will affect humans. How is warming far better for the 634 million people living near the coast should sea levels rise 10 meters? No. Double check to see your illogical response. No one mentioned a single year or city. My graph shows it was cooling until about 150 years ago. Right, in a graph showing over 8,000 years of data, ignore the overall trend to advance your political agenda. Oh. How did you reach this conclusion? And by the way, how did you reach the conclusion that it will effect people negatively? That is ridiculous. Lets say this absurd fear mongering claim is true. There are about 10 times as many people on Earth. It seems you are ignoring the benefits to the 90% only b/c 10% will be inconvenienced in having to relocate. You know what solar cycles are, don't you? As the engine behind Earth's climate, solar cycles are very predictable and perfectly explain the variability see in Earth's climate going back millions of years. The Maunder Minimum 400 years ago corresponds with the Little Ice Age when temperatures were about 1 °C cooler than today. You may be thinking of the Medieval warm period, about 1,000 years ago when temperatures were only about 0.5 °C. If you project future temperatures based on these cycles, as done in Perry and Hsu (2000), you see gradual cooling during the next few centuries with intermittent minor warmups and a return to near Little Ice Age conditions within the next 500 years. The problem for global warming deniers is that Earth's mean global surface temperature is not following this pattern. While Earth's mean temperature fluctuates over centuries, it has never changed so much so rapidly. Did you not link in post #502 to an article about the temperature in Atlanta on Thursday, August 15th? Following your own illogical response, you must be no one. So, as that MIT scientist said, if we do the best we can to warm the planet, it may put off the next ice age by as much as 50 years. Is that a bad thing? You meen the ice age that wouldn't have started for another 40,000 years anyway? Gee, destroying the ecosystem now seems like such a plus. FUTURE CLIMATIC CHANGES: ARE WE ENTERING AN EXCEPTIONALLY LONG INTERGLACIAL? BTW, Cleisthenes, you are full of self denial. First, your graph shows an 8,000 year cooling trend. This means the overall trend of cooling remains the case. Second, in that 8,000 years there is variation, including the last 150 years. Third, the normal variation of relative warming your graph shows in the last 150 years, does not make up for the previous 7, 850 years of cooling; meaning it is cooler now than your graph shows it was 8,000 years ago. Fourth, you want use the last 150 years where warming is shown to supersede the 8,000 year trend; meaning you want to use 1.9% of the data to reach your politically driven decision, while ignoring 98.1% of your own data. Destroying the ecosystem. Now there is an emotion laden phrase. Kind of like killing off all of the polar bears or children in England will never see snow again.